By now you’ve undoubtedly heard of Heartbleed, the Internet security bug that triggered alarm bells around the world and shut down a number of Canadian government websites, including the Canada Revenue Agency (CRA), for several days in mid-April. Heartbleed is a major coding error in OpenSSL, software code designed to make communications secure on more than two-thirds of active Internet websites worldwide, plus email, chat servers and virtual private networks. The software encrypts and protects the privacy of passwords, banking information and other sensitive data that you type into “secure” websites. Such websites are identified by the “lock” icon (HTTPS)on your browser. The flaw exposes this information to potential theft by computer hackers and cybercriminals. What’s more, it is impossible after the fact to determine who may have gained unlawful access to the data. Mark Nunnikhoven is the Ottawa-based vice president, Cloud & Emerging Technologies, at Trend Micro, a global leader in cloud security. He says that Heartbleed enables a hacker to grab random snippets of information from a server and assemble them like a puzzle. 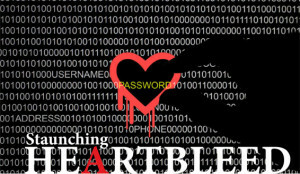 While the existence of Heartbleed only recently became public, the researchers who discovered it say the flaw has been around for about two years. A patched version of OpenSSL is now available to repair the problem and software companies are updating their code and informing users of the fix. On the other hand, if it takes a week for an organization to post a basic notice about Heartbleed, you might want to question them about it, he says. Canadians do very poorly. You should have a unique password for every website for which you have an account. No two passwords should be the same and anything that can connect money or critical data services like cloud backups should never share passwords. Nunnikhoven recommends that you use a password manager, which lets you create a master password; software then creates a unique password for every site you use. You don’t need to know or remember your passwords, because they’re all stored and protected behind one very strong master password. Business owners who run their own systems need to ensure they’re using the latest version of OpenSSL, says Nunnikhoven. Those who don’t run their own systems should contact their service provider to make sure the issue has been resolved, he adds. Handy online tools such as the one available at http://filippo.io/Heartbleed/ will verify whether a server has been fixed.